This is, no kidding, Peanut’s new favorite lunch. And mine too! It’s one I found on Rumble in the Kitchen a while back, and I can’t believe how long it took me to try it! I’m on my third batch of it in as many weeks. I doubled the spice level of mine because my heat tolerance is certifiable; otherwise I didn’t adapt it much. Any suggestions for other things to add to this to get some variety going? Serve warm, or store in the fridge and eat it cold! *That’s 128 grams of peanut butter, if you’re interested; scooping it into a bowl on a scale is easier than smooshing it into a measuring cup! 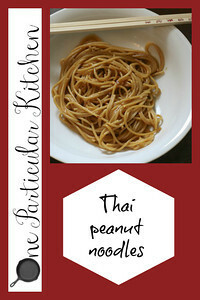 I love that peanut noodles are peanut’s favorite lunch, ha ha! I think I’d add some edamame just for color and a little something extra. You could get crazy with other veggies too I think! Great base pasta. Ooh great idea! I thought about some broccoli, too. this is one of my favorite dishes to riff on! any sort of Asian peanut butter based noodle dish. I love to add cold, raw julienned cucumbers, bell peppers and carrots to the dish. if you serve the noodles warm, they’ll soften the veggies a bit when you mix them in. but if you like the contrast of texture, add the veggies in once the noodles have cooled down. LOVE. Ooh red bell peppers! That sounds awesome. I wonder if I could substitute almond butter for the peanut butter (allergic)? Is there something else I could add that would mimic the taste of peanut butter? I am also thinking of subbing soba noodles? What do you think? I am very much of the school of thought that you won’t know till you try. 🙂 I would definitely do the almond butter, and try it with the soba too and see what you think! Junecutie, have you tried Soy Nut Butter? We use the I.M. Healthy brand in our house and I think the taste and texture are very similar to peanut butter (not quite as sweet). If you use almond butter, I’d definitely thin the sauce with a bit more pasta water – almond butter is super tasty, but significantly heavier than peanut or soy. We had these noodles with dinner last night and they really were delicious! I can’t do Soy Nut Butter, either. I am allergic to soy, as well. It’s more of a ‘legume allergy’ thing than a nut allergy. But thanks for the thought, anyway. I’m not sure about Sunbutter. I’m going to research the ingredients. A legume allergy is a real pain. My kids always complained that I never made them peanut butter cookies. If that’s my only failing, then I did GOOD! Thanks.